Rock Islands Southern Lagoon is a marine landscape that includes 445 iconically shaped, uninhabited islands. The archipelago is of volcanic origin. Abundant rainfall has created diverse habitats, including 52 marine lakes. Some of the islands were periodically settled by Paluans in the past, and they continue to visit. Prehistoric cave burial sites, rock art and remains of later settlements on the island clusters of Ulong and Ngemelis and three islands (Ngeruktabel, Ngeanges, and Chomedokl) testify of that. Rock Islands Southern Lagoon so far is Palau’s only WHS. It encompasses a marine area south of the nation’s main islands Babeldaob and Koror. The lagoon is a maze of some 445 karstic islands, of which many show a typical mushroom-like shape. 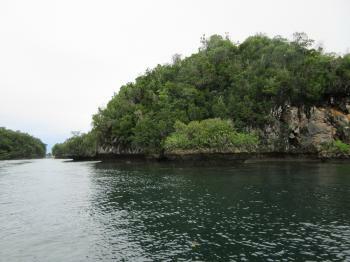 The site is a mixed WHS: some difficult to access archaeological sites are part of the core area too, mostly on Ulong and Ngeruktabel islands. The WHS cannot be visited under your own steam: you have to join a tour, hire private boat transport or step on the state ferry to the outlying island of Peleliu that only runs twice a week. I visited the Rock Islands with Impac Tours – this may be Palau’s largest and most professional tour outfitter, aimed especially at a Japanese audience but other nationalities are welcome too. On my tour an English speaking guide and a Chinese & Korean speaking guide supported the Japanese head guide. The cost was 95 USD for the tour, plus 50 USD for a special conservation permit. I joined 20 other tourists on the ‘Rock Islands plus Kayaking’ full day tour. Around 9 a.m. each day you’ll see many boats leaving the tourist resort of Koror – one hardly has the lagoon (which isn’t too big by the way) to itself. But it must be said that the Impac guides tried to avoid anchoring at places where there were already other boats. Probably the best part of the day was the hour that we spent kayaking. A kayak gets you up and close with the islands. You’ll notice the sharpness of their limestone ridges that protrude above sea level, you can touch them with your hands. We kayaked into a small bay, where we were in for a surprise as I spotted a smallish crocodile on the shore! According to the nomination file, only 500-750 saltwater crocodiles inhabit this conservation zone. For lunch we stopped at one of the bigger islands, one of the few that has a sandy beach. 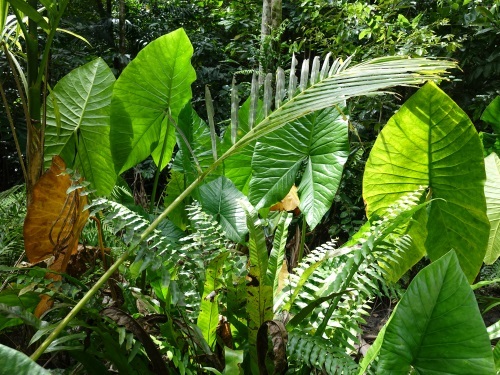 This also presented an opportunity to have a closer look at the flora of these islands. All Rock Islands are lush and green – it rains a lot here. Huge ferns and palm trees are prominent, but so are exotic-looking flower and fruit bearing plants that I do not know the name of. 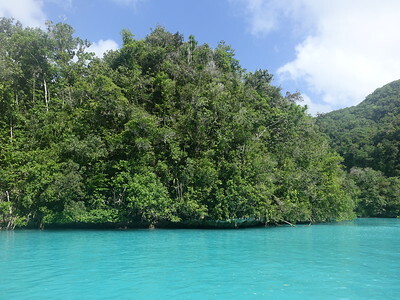 Most tourists visit Palau and the Rock Islands because of the excellent diving opportunities. On this tour we had the chance to sample some underwater life at two different snorkeling spots. It was my first time to snorkel and I could not really get much pleasure out of it (I'm not really a 'water person'). But it may be clear that marine life is both colourful and abundant here. The Rock Islands have been compared to Halong Bay, but Palau's remote location in the Pacific guarantees that this area stays much more pristine than the Vietnamese tourist trap. The shapes of the karst islands are different as well. 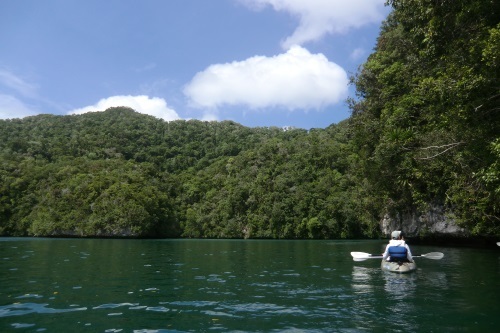 Unfortunately, the Rock Islands’ distinctive marine lakes cannot be visited (the only one that generally is open to tourists, Jellyfish Lake, is still recovering from 2016's El Niño effects). The button-shaped, jungle covered islands Rock Islands were nice and interesting to see above the water as we cruised around on our tour, but the real attractions are below the surface. The absolute highlight, of course, was Jellyfish Lake, which, as of our January 2019 visit was back in business and open to the touring public. Snorkeling with these eerie creatures was incredible. We had two days out among the Rock Islands. The first afternoon we went kayaking with a little bit of snorkeling at a couple different spots. Kayaking was a lot of fun and we were glad we'd decided to do it. The next day we did the grand tour, which included: the Milky Way (you cover your skin with smooth limestone mud from the sea floor); snorkeling at several spots such as Clam City (Giant Clams), the "Big Drop", Jellyfish Lake, and more; lunch at the scenic Long Beach (an island with a very long, smooth sand bar); and boating beneath a nice rock natural arch. The snorkeling was fantastic with lots of variety of coral, uncountable colorful tropical fish, sea turtles, rays, starfish,... It was probably worth it even without the jellyfish. But with the jellies included, we were all smiles. We booked our tour through the Antelope Guest House and were very happy with the service we got. We were the only guests with our guide both days, and had Jellyfish Lake all to ourselves for most of the time we were there, though a bigger group did come along when we were about 3/4 the way through our time there. The price of our tours was about the same as the bigger agencies, but it was nice not being in a big group. Jellyfish permits are currently $100 which is good for exploring the Rock Islands for 10 days. We were told they are considering raising the price. There's a lower cost $50 Rock Island permit to see the rest of the islands if you don't go into Jellyfish Lake. They ask you not to put on sunblock before entering Jellyfish Lake and try to rinse people off a little bit. We had the sunburns to prove our commitment to the survival of the jellies (but they think it was more the natural El Nino effects that caused their decline (down to nearly zero) rather than sunblock chemicals). The Rock Islands were really a fantastic experience. Palau in general was really great, and the Badrulchau Stone Monoliths at the north end of the main island would probably be of interest to most people on this website and I was happy we made the effort to see them. The Republic of Palau is one of these destinations that isn’t frequently visited by tourists. And those that do are mainly Asian (Chinese) tourists. 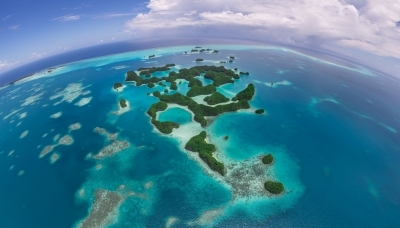 Palau has just 1 WHS site and that’s the rock islands. There are many but the most famous is the 70 Islands cluster. You can’t go in there anymore. The only way to see them is from the air! I did a helicopter flight over Palau which is an amazing experience. You see much better these rock islands. The next day I also did a Kayak tour where you get closer to other rock islands. Both tours gave me a good view of this WHS. I liked it as it’s unique. Unfortunately, I couldn’t visit all the TWHS; I missed the stone money quarry as I ran out of time. But, I did visit Yap and saw the stone money a week later. Will be back to Palau one day I hope as I still want to go diving there. Palau is rather rarely visited and expensive destination, but once someone decides to go, visiting Rock Islands is the must. They are a symbol of the country, their aerial view is presented on postcards, advertising materials, even politicians put their photos on this background on election billboards. Rock Islands are also considered one of the most stunning diving spots on Earth. 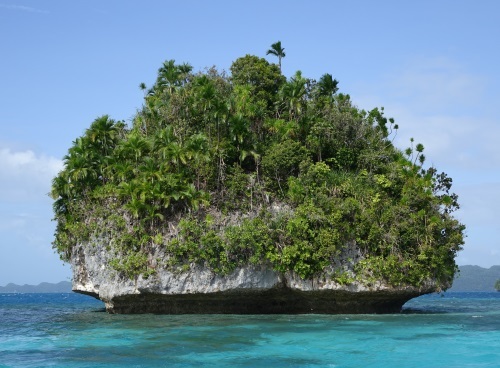 Rock Islands are - as the name suggests - a group of hundreds of stone islands and islets, most of them uninhabited and entirely covered by tropical jungle. They are similar to other famous and UNESCO-listed sites, such as Ha Long in Vietnam. First islands may be visited from Koror, the biggest town in this tiny country (17k population total and about 12k lives in Koror), but inscribed area is 'Southern Lagoon' only, so to visit the site properly you have to either take a public ferry to Peleliu (I found no information on that in Koror) or buy one of the organised tours. The tours are very expensive and make this WHS one the most pricey on the list. Basic fare for a ship and snorkeling in the lagoon is 125 USD per person (children under 6 go free) and you have to add an obligatory state permit of 50 USD pp. The permit is valid for 10 days but you cannot buy it for shorter terms, even if you go there for a couple of hours only. So the minimum fee is 175 USD (diving is obviously much more expensive). The trip we took (me, my wife and our two small kids) was aimed for divers, so they chose a good place for diving but a bit too deep for snorkeling. Nonetheless it was fine, but there are many better snorkeling spots in many places on our planet. It took us about one and a half hour one way to go there with a very high speed, so good wind protection is advised (the boat is open and has only tarp roof). Unfortunately our experience was messed up by the weather. After some snorkeling, in the middle of the sea, it started to rain heavily. Our older son started crying and demanded to go home. The retreat was terrible and nobody on the boat had a piece of dry cloth or towel. I have to add that the most interesting part of the Rock Islands, the world famous Jellyfish Lake, due to the dramatic decrease of the Jellyfish population since April 2016 is closed until further notice. Hopefully the jellyfish will recover, as it happened in the past and the Lake will be reopened. Marine sites: UNESCO map states "Percentage Marine 95% Land 5%"
Pygmy Peoples: Fossils of 'Small-Bodied Humans' were supposedly found at Omedokel cave - later studies argue that "early Palauans were of normal size and that their physical characteristics are well within the variation seen in modern human populations"